Who doesn’t like the idea of getting a back massage, right? A few minutes of pampering and relaxation is the perfect addition to a day at the spa. We all need some time to unwind, right? But what if a back massage is not a nice to have but a necessity? What if you need massages to treat serious health problems? That’s the reality for many individuals who live with back or joint problems. Unfortunately, we can’t all have massage therapists on hand 24/7. 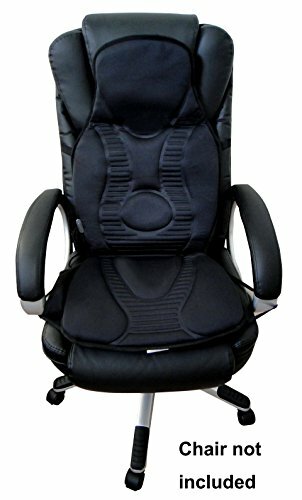 That’s why you’ll love the list of best back massager units listed below. 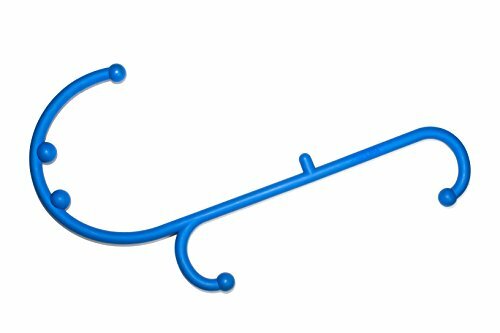 Technological advances and a few creative designs have led to some interesting products and somewhere on this list of best back massagers is the ideal product for your needs. The key to a healthier you can be in back massagers ranging from manual to electric devices. Let’s discuss a few facts to help you pick yours. Therapy at home:You don’t have to visit a doctor for regular treatment. You can treat minor problems yourself or continue treatment according to a doctor’s directions. Portable treatment option: A break in treatment could cause problems. 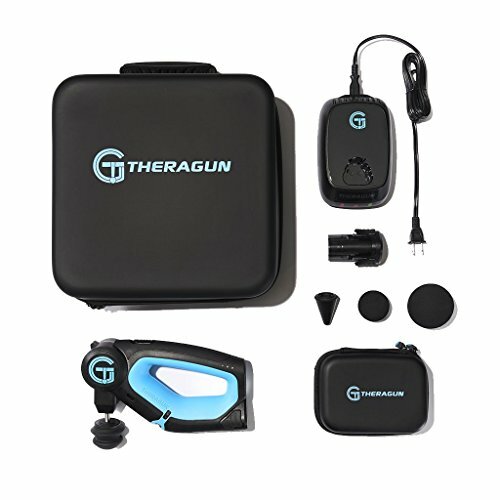 Now you can take your therapeutic devices with you everywhere you go. Counter pain: A massage helps alleviate or stop pain thanks to increased blood flow and release of certain chemicals. It can also affect your nerves so your brain registers less pain. Better sleep thanks to less tension: You may sleep restless when your body is tense or in pain. After a massage this pain should be less which leads to better quality sleep. Rest is vital when your body is recovering from overexertion or an operation so a simple massage has far reaching effects. Strengthen your body: Help your muscles stay in shape and even strengthen. This is vital for individuals who sit and work all day & need a solution to work their back or leg muscles. Manage tension and stress: Mental stress often has a physical effect on the body such as tight muscles and headaches brought on by tension in the neck. A back massager can counter all these effects. Relaxation on demand: For medical or personal reasons you can have a massage at any time you want. As mentioned above a good back massage can be used to treat pain. Now, because technological advances empower manufacturers to build effective treatment features into compact and affordable devices, almost anyone can own one. That means you can have effective pain treatment without visiting a medical professional. Of course severe health problems should be treated with the assistance of your doctor but with a back massager at home he or she can take on an advisory role. You don’t have to pay for regular visits and treatments anymore. Improving blood flow to muscles or injured areas for faster recovery. This happens because more oxygen reaches those areas. Strengthening muscles to prevent injury due to weakness. Muscles that don’t get exercise tend to deteriorate. A massage keeps these muscles active so they can keep their strength and mobility. This prevents and counters pain caused by stiffness in muscles & joints. Atrophied tissue can start healing. Once again a massage forces more oxygen into those areas of the body. Oxygen is vital for cells that need to repair themselves. Pain can become less or disappear completely when a massage helps to set free endorphins, dopamine, serotonin and other chemicals. 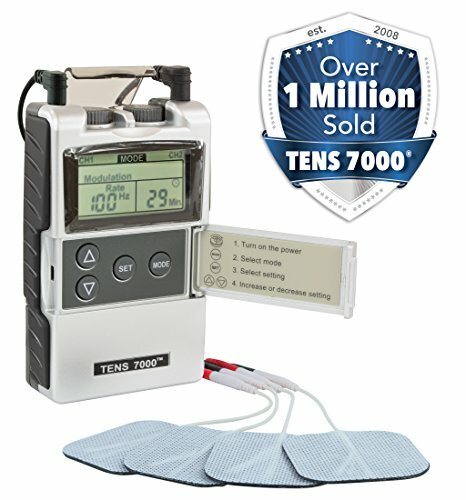 Massagers that incorporate electric impulses can even stop neurons from communicating pain to the brain so you experience less pain while a certain part of the body recovers. This makes recovery more bearable. The vibrations of the back massager affect nerves and stimulates your body which can counter pain. 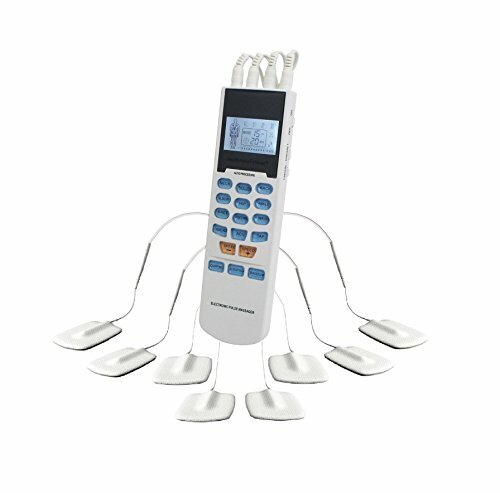 Now you simply have to pick the right back massager for your particular situation. The market is flooded with massage options and we’ll look at four popular types. 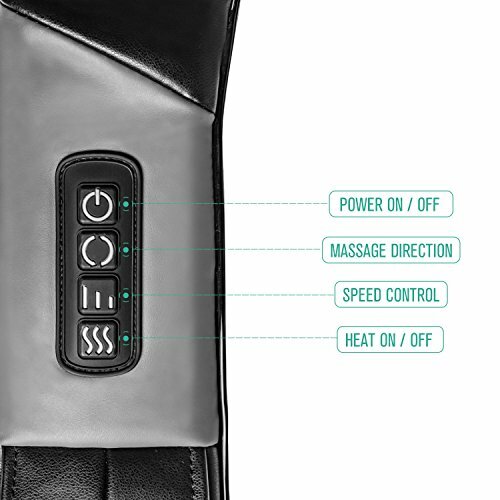 A handheld device helps you simulate massage techniques you would get from a professional massage therapist or physical therapist. Handheld devices are designed in ways that allow you to reach certain parts of the body and apply pressure. 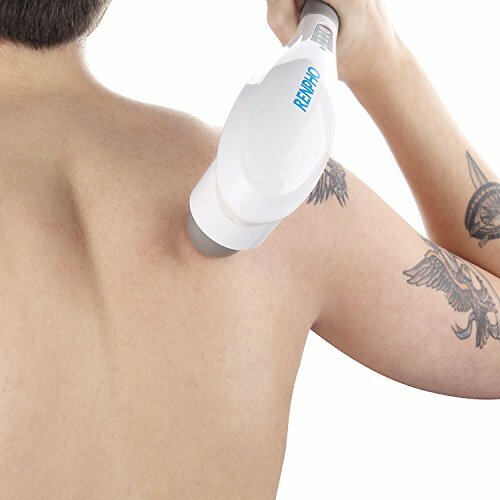 Their unique designs can incorporate vibrating and/or heat treatments to reach deeper tissue and help relieve muscle pain. 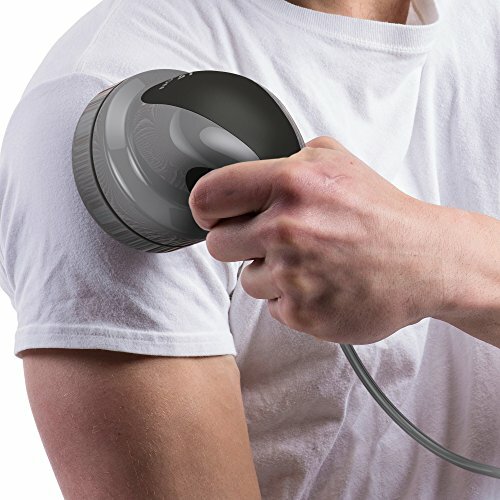 An electronic pulse massager has small electrodes running from a machine to soft pads. 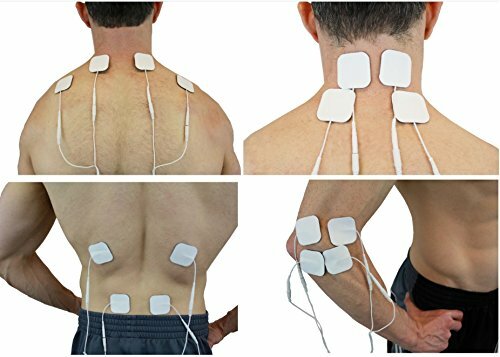 You place these pads on your muscles and when you turn on the machine electronic impulses are sent to that area via the wires. These impulses can be managed in terms of strength and are aimed at stimulating muscles & nerves. This can increase blood flow, affect how the nerves work and simulate muscle contractions. All these effects combine to help treat pain and keep muscles healthy. A Shiatsu massager is designed to help restore balance in the body. It not only massages certain pressure points but affects joints with rotation and stretching. These massagers can be fully body units you can place on a chair or smaller types you fit across your shoulders or other parts of the body. The vibrations in these massagers are meant to stimulate parts of the body. This can be through rotating motion too. The effects are more relaxed muscles and the vibration strength & the pressure levels can be changed to suit your needs. Are the features relevant to your specific need? Is it light enough for you to handle without straining yourself? Does it have enough safety features especially if it will be used where there are children around? An auto shut off features helps to prevent overheating. What does it require from you? Does your condition—flexibility and health—allow you to use it effectively? 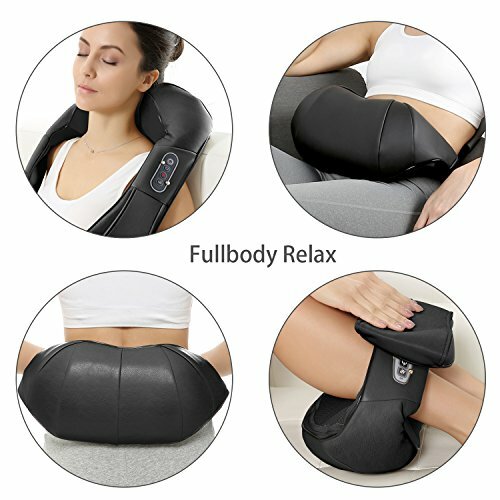 With your priority list in hand you can browse these reviews to find the best home back massager for you. Here’s a very uniquely shaped massager but once you’ve used it you understand the reason for this design. It’s designed ergonomically so you can sit or lie down in natural positions but be able to massage those hard to reach areas. It’s made from durable plastic but it will still flex and bend so you don’t hurt the muscles or skin in the area you massage. All plastic is BPA free and even hypoallergenic so it’s safe for anyone to use. This is to treat pain and even fatigue and is power driven so you don’t have to do all the hard work yourself. Here’s the first one on our list with a heat feature. It’s designed as a portable massager so you can take your therapy tools on the road with you if needed. 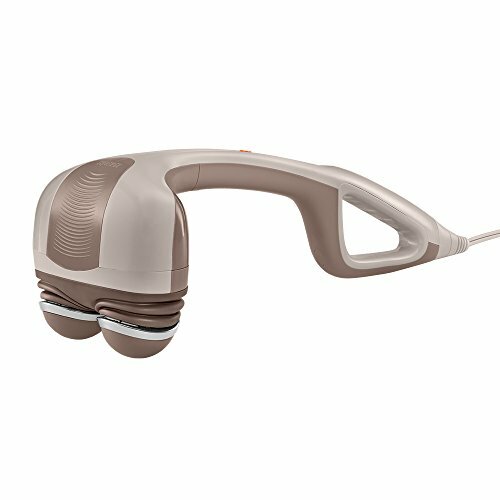 The head provides a kneading movement so your massage isn’t only superficial. With 3100 pulses every minute you can get a high quality massage almost anywhere. The heat function is optional and you can adjust the intensity so you can customize it to your specific needs. It’s slightly heavier than other handhelds so make sure you can easily pick it up and control it before you pick this one. You’ll also find four different arm settings so you can easily find the ideal position and feel comfortable using it. It’s cordless so if you keep it charged you can use it anywhere in the home. Here’s an easy way to get a Shiatsu massage. 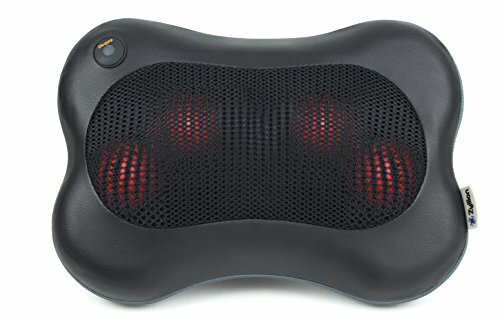 This pillow has a heating function and moving nodes to work on sore muscles. The heating feature can be turned off so you can customize your experience. The nodes change direction every 60 seconds to improve your treatment. You use the straps to either attach it to a certain part of the body or a chair so you can sit on or against it. It’s impressively safe against overheating and has an auto shut off feature. 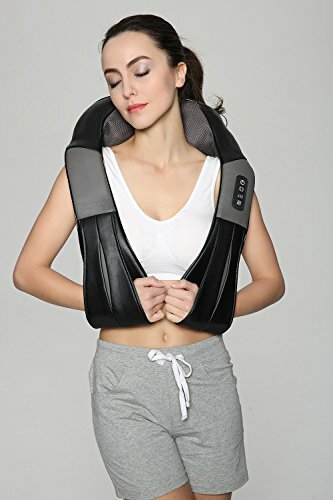 Here’s a super comfortable way to massage your neck or back. You thread your arms through the gaps and let it rest on your neck then let the Shiatsu heads do their jobs. Their movements are designed to simulate someone massaging your neck or back. It’s compact enough to place in a suitcase so you can take it to the office or on a trip. The 6ft cord allows you a lot of room to move with it. The car adapter means you can use it almost anywhere. With three different speed modes and a heat feature you can customize according to your muscles’ needs. Although designed for the neck you can put it on almost any part of the body such as wrapping it around your calf area. Note that it’s not advisable to use if you have a history of blood clots. 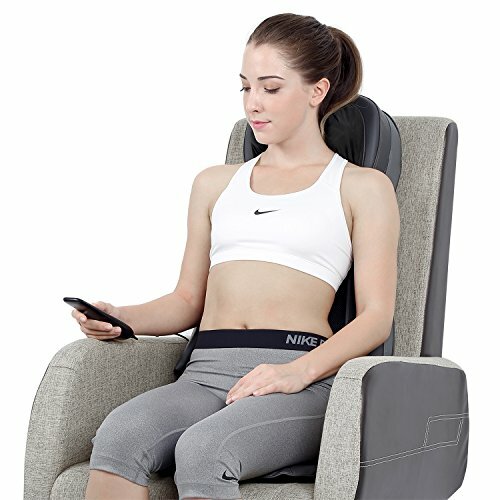 Why stand and massage painful areas if you can sit on a massaging seat? You can fold it and take it with you to take on a trip or to use at the office. The main treatment method is vibration. For safety—and in case you fall asleep during your treatment—it will automatically shut down after 30 minutes. Here you get another massage seat but with the added benefit of the Shiatsu massage effect. There are eight different nodes that role around and provide deep kneading. It’s matched with vibrations and a heat function & is mostly for neck and back massaging. You need the right chair so it can fit over the back and to ensure it doesn’t move too much during your massage. Dimensions: It’s designed for individuals between 1.6m – 1.8m tall. Outside these parameters you may not enjoy the full effect in the correct areas of your body. 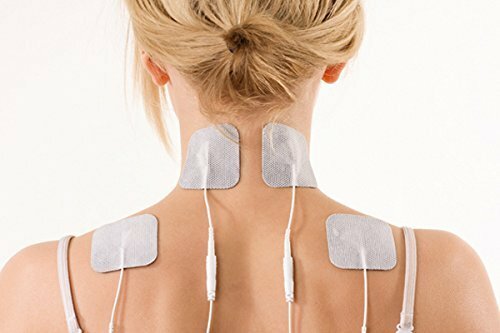 It provides TENS (Transcutaneous Electrical Nerve Stimulation) and EMS (Electrical Muscle Stimulation) treatment. It’s powered by AAA batteries so you can carry it anywhere instead of being restricted to work near an AC power outlet. It’s important to note that you should consult with a doctor first if you have certain health conditions. The treatment does have the potential to irritate the skin if used for long periods of time. 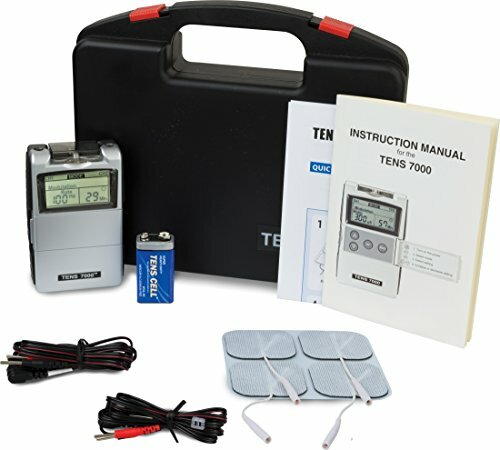 Here is another TENS unit and this one comes in a handy carry case so you can take your therapy tools everywhere. You may also like our review of the Compex Muscle Stimulator. It’s safe to use thanks to the safety amplitude cap and has a one year warranty. The battery should last you 48 hours. 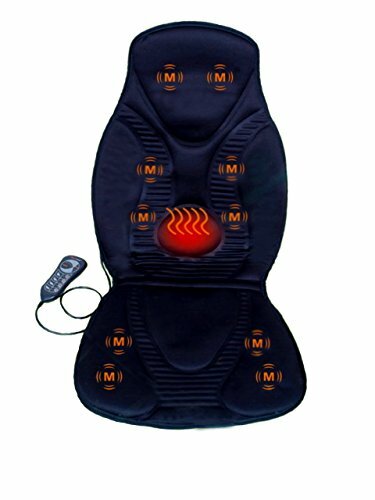 Can a Back Massager Ease Sciatic Nerve Pain? If you’ve ever had that searing pain in your lower back because of your sciatic nerve you’ll know how important it is to get fast relief. The reason for it being such a prominent problem is because this affects the largest nerve in the body. It can also lead to numbness and can affect your mobility and a loss of concentration. That affects work and home life. 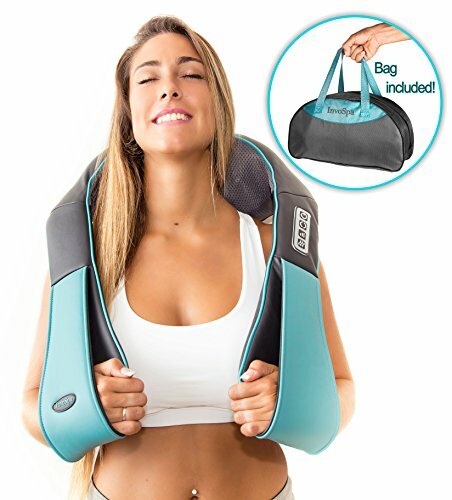 If the symptoms include extreme numbness and weakness the condition may require surgery so the severity of the problem will determine how much relief you get from a back massager. 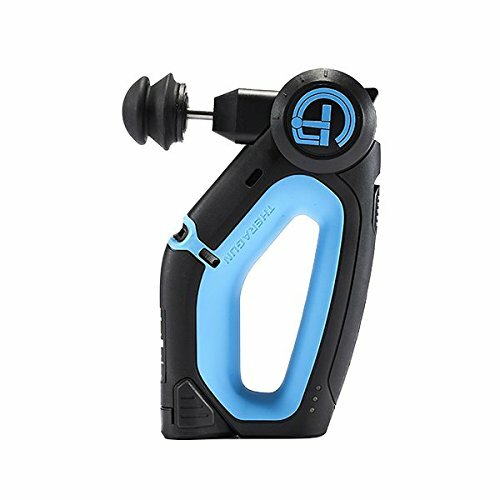 Do handheld (percussion/action) massagers loose power when you add a lot of pressure? Here the power of the motor in the massager determines what will happen. 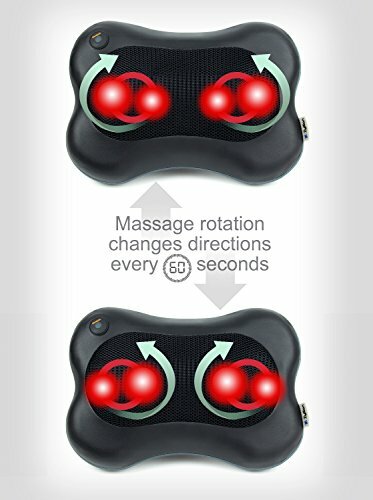 On low end models with weak motors you can stop the vibrations when you press the massager very hard onto your muscles. A quality machine will keep a consistent rhythm despite the pressure so you can massage the areas deep under the skin too. Yes you may feel the rhythm change but it won’t stop completely. Ideally a massager should give a deep tissue massage even without you putting a lot of pressure on it. 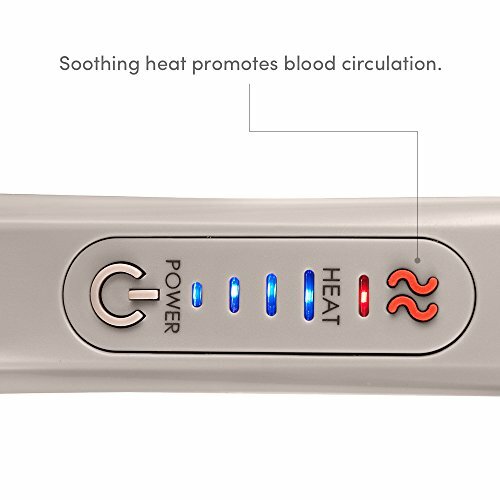 Therefore heat in one of the best electric massagers is a great feature that helps treat pain and also speeds up recovery when the oxygen and nutrients start healing damaged tissue. Anything you do while being pregnant should be done with care and it’s best to ask advice from a physician. You should avoid electric massagers that send impulses to your muscles. These impulses can have a negative impact on the baby. You can also trigger contractions by massaging pressure points and some aromatherapy oils aren’t beneficial. The last trimester’s nerve pain can be countered. Studies show it can regulate hormones which can even minimize complications. There can be improved blood flow which can positively impact growth. 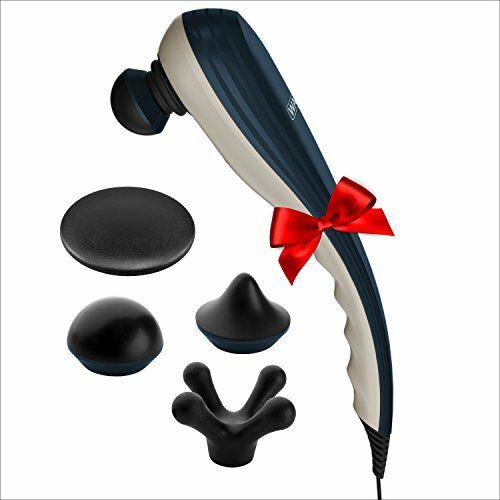 So put the best back massager you see above on your gift list for your baby shower! So now that we have gone over what we feel are the best massagers on the market what is your next step? Make a list of your specific needs in terms of muscle relaxations or pain relief. Then pick the one that will best suit your needs while also considering your personal health. There’s a solution to manage pain better and now you know how.